Has VCR been a boon or a bust for merchants since it was implemented? How will Mastercard’s new rules speed up the dispute resolution process? Will any reason codes change with the updates? Who will be impacted by new Negative Option Billing rules? Mastercard has a new plan to streamline and simplify chargeback resolution...and it’s already being implemented. Shortened timeframes, updated policies, and procedural mandates promise to revolutionize the way financial institutions and merchants process cardholder disputes. At the same time, it may mean changes to your business and the way you handle chargebacks. Our exhaustive report covers the key changes, when they will be rolled out, and what merchants can do to prepare. We’ll even offer insight on how you can leverage the new system to reduce chargebacks and increase revenue. Download your free copy now! Just as merchants acclimate to last year's Visa Claims Resolution (VCR) initiative, Mastercard has begun introducing new mandates to its processes, as well. Adapting to these types of large-scale changes can prove disruptive and highly frustrating to some merchants. Others may find the updates require a minimal adjustment. 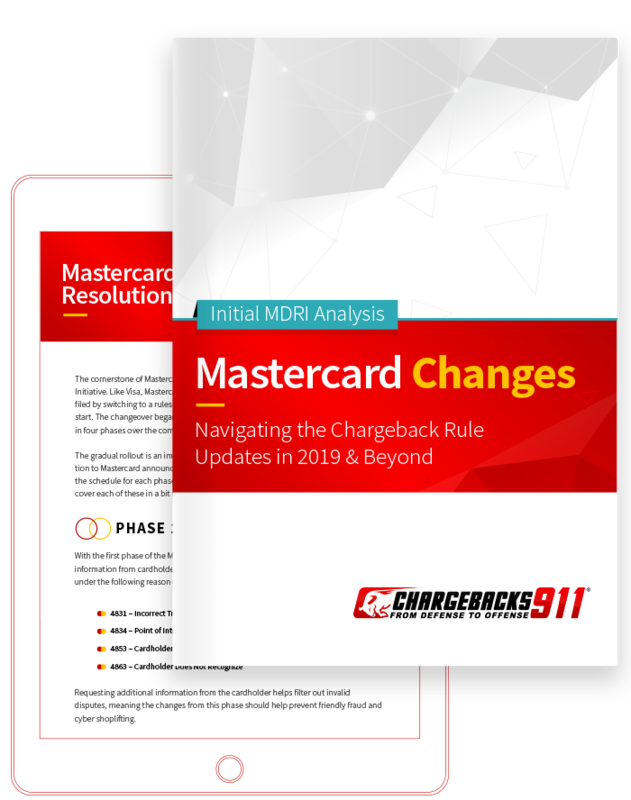 The most comprehensive of the new mandates, the Mastercard Dispute Resolution Initiative (MDRI), is designed for faster, easier handling of chargeback disputes. Like VCR, the new Mastercard initiative evolves the dispute process into a rules-based system. While the two mandates are not identical, the aims behind them are similar. Both processes will update certain dispute reason codes, reduce timeframes to speed up dispute resolutions, and improve the dispute process by automatically detecting invalid cases.